The weather in Korea has been uncomfortably hot and humid lately. It’s the kind of heat that’s got me stripping down to nothing and blasting the air conditioner all day and night to cool off. Summer solstice was almost a month ago and temperatures keep rising to miserable heights. Koreans are still keeping their clothes on in this scorching heat though. They “fight the heat with heat” by downing hot steamy dishes that really work up a sweat. My neighbor friend, Rochelle, told me that today marks the first day of Sambok, which refers to the three hottest days of the summer. 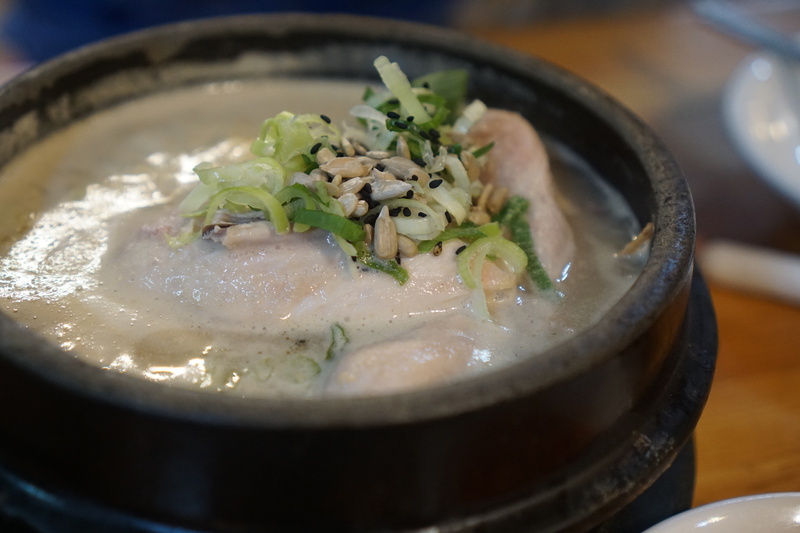 During the hottest days of summer, Koreans traditionally eat a dish called Samgyetang, a whole young chicken stuffed with glutinous rice, ginseng, garlic, gingko nuts, and jujubes in a steamy broth. It is believed that eating hot foods would help overcome the summer heat and prevent illness and fatigue. I had Samgyetang about a month ago before I even knew what it really was. 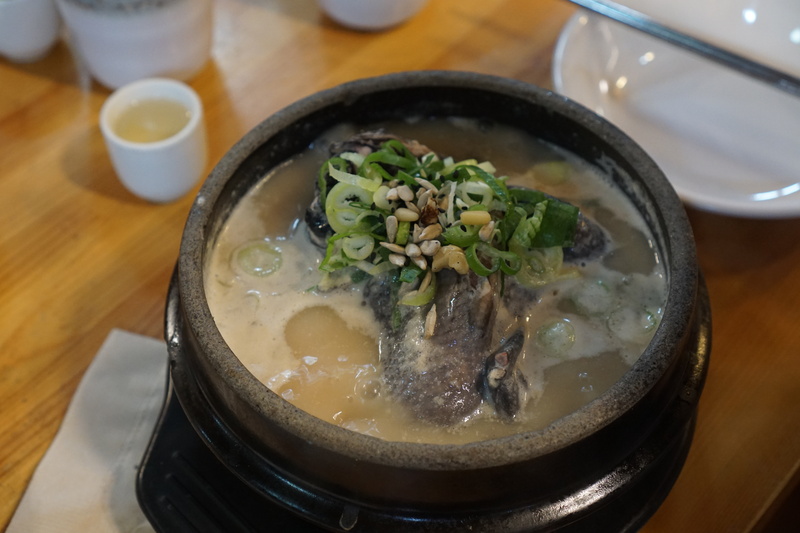 My brother and sister came to visit in June and one of our stops was at Tosokchon Samgyetang Restaurant known specifically for this dish. This restaurant was huge and jammed packed with people in every corner! They were serving up bowl after bowl of this hot goodness. 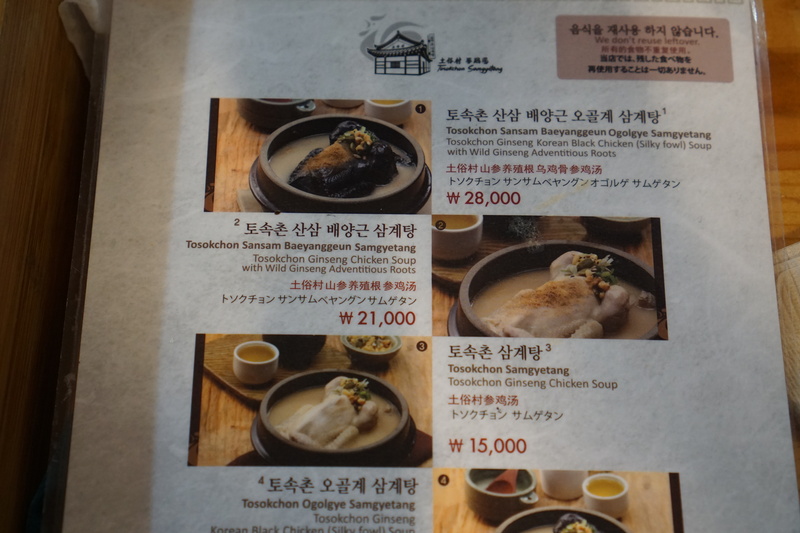 The menu was fairly simple with no more than 10-15 items but we were here strictly for the ginseng chicken soup. We ordered the original stuffed white chicken soup and the interesting looking black stuffed chicken. We munched on the kimchi and kimchi radish they had in pots on the table while we waited for the main course. There were also 3 small cups of some type of ginseng wine concoction that we saved until the end of the meal. It didn’t take them long to bring out the 2 bowls of Samgyetang. I was more excited for the black chicken than the white one, simply because of the novelty of it. The soup was scorching hot and so steamy that it fogged up my camera lens. We got mini steam facials from hovering over the bowls! My brother didn’t hesitate to dig straight into the white chicken and scooped up a spoonful of rice and ginseng. I went for the silky black chicken with my spoon and the tender meat slid right off the bone. The broth was bubbly hot, creamy, and flavorful. Upon the first spoon, I was reminded of one of my favorite comfort foods, cháo gà, a Vietnamese chicken rice porridge (aka congee). It wasn’t exactly the same as the Vietnamese dish and I didn’t expect it to be, but there were definitely some notes of familiar flavors that hit my tongue. The black silky chicken did not taste much different to me than the white chicken, which is unfortunate because it was higher in price. The only noticeable difference between the two is the texture. The black chicken is silkier with a slimier skin. My sister couldn’t get over the look of the black chicken, but to be honest if I had to do a blindfolded taste test between the two…I probably wouldn’t know the difference. I don’t discriminate, I equally enjoyed both the white and black chickens. After battling over wishbones and slurping up the last drops of soup, we finished off our brunch by clinking our cups and downing the bitter shots of ginseng. The shot of ginseng juice tasted disgusting but when it Korea….do as they do! It was a costly lunch by Korean standards, but a worthwhile dining experience. I plan to have Samgyetang again hopefully here in my own neighborhood of Shincheorwon not only during these hot summer days, but also to warm my cold bones in the winter. If should ever find yourself in Korea, go try Samgyetang! Go straight about 170m and turn left onto Jahamun-ro 5-gil Road. Tosokchon (토속촌) is located 10m ahead on the left. 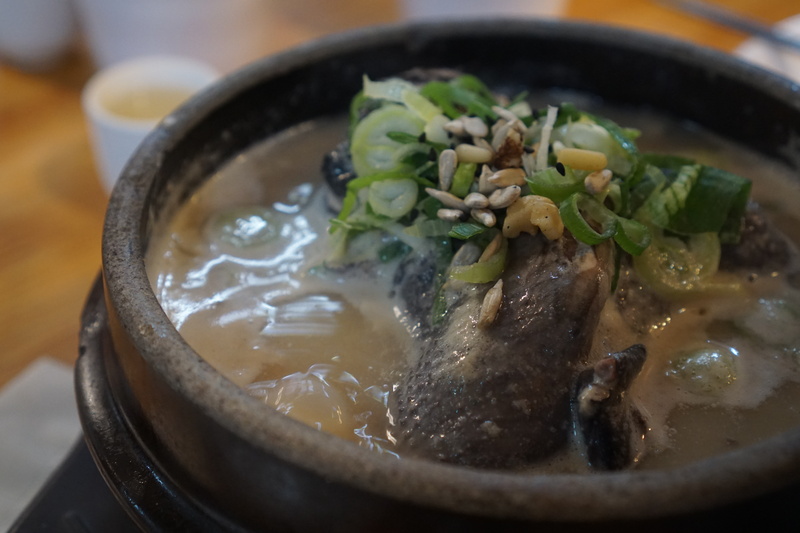 My samgyetang dining experience is captured in my vlog from last month, fast forward to 9:50 to 16:54 in the video just for the Tosokchon Samgyetang moments! This entry was posted in #KimmyeatsKorea, EAT, Food, Korea, TRAVEL, WATCH and tagged #KimmyeatsKorea, Chicken, Chickensoup, food, foodie, Ginseng, Korea, Koreancuisine, KoreanFood, Samgyetang. Bookmark the permalink.